Cyber Force is back! A reimagining from Matt Hawkins and Bryan Hill introduce a new beginning for the classic series. You don't have to be familiar with the original series to enjoy this new iteration. In fact, 'Cyber Force' #1 is your prototypical origin story where the players are introduced including a devastatingly lethal villain. It opens with said villain striking a huge terrorist strike brought vividly to life by Atilio Rojo. Humanity has become too dependent on technology and this act of terrorism is supposed to be the first wave of resistance, a preventive measure to keep humans from destroying themselves. In the aftermath of the attack of one of the world's biggest technology companies, one man survives, Morgan Stryker, maimed and severely wounded, unknowingly undergoes a transformation that will weaponize him against this villain. Morgan's paraplegic daughter signs off on the procedure that will save his life but will also make him part-man, part-cyborg. It's a tradeoff he knows will put him at the mercy of his employer, that their generosity does not come without strings. It's the foundation for what comes next as the genesis for Top Cow's classic series reborn. Hawkins and Hill perfectly set up the stakes as well as the origin of Cyber Force. Technology has indeed embedded itself in our daily lives from social media to artificial intelligence. How far is too far and is transhumanism the next evolution we'll face next? For the purpose of this story that reality is now and perhaps not as far-fetched as we'd like to believe. Rojo creates a world a lot like our own with technological advances that aren't too far off. The villain's capability to hack broadcast networks to spread its message of self-righteousness around the world is believable and Rojo's layouts convey a quick montage of scenes from other countries. The art is rich in color and vividly penciled so the details in each panel are clear and tell the story even without words. Of course, the scenes of destruction are masterfully choreographed so upcoming action scenes are sure to be just as kinetic. 'Cyber Force' #1 ushers in a new era of action under the tutelage of creator Marc Silvestri giving this classic title newfound relevance to the ever-changing technological age. Hawkins, Hill, and Rojo are more than up to the task with a lean mean debut issue that sets off the series with a bang. It leads to some moral questions about our addiction to technology both as passive mediums and as scientific experimentations. How far will we go technologically before we lose our humanity altogether and to what lengths will we go to protect it? 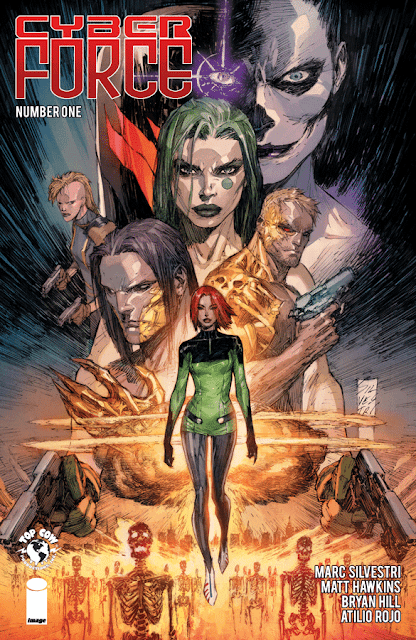 Cyber Force is back and more exciting and relevant than ever.